Hi everyone! 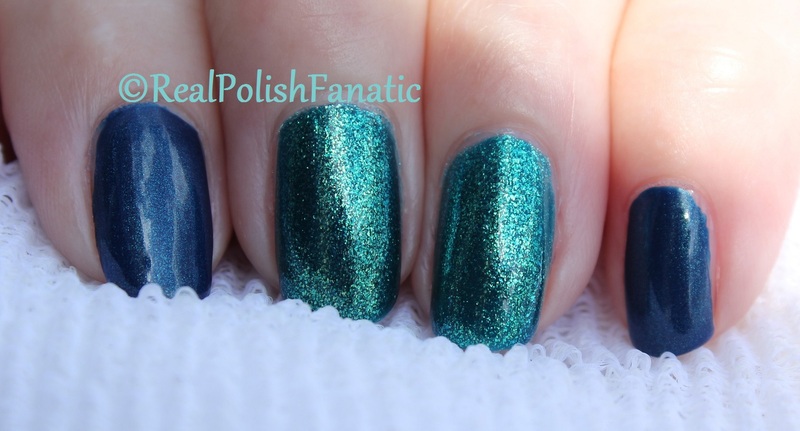 Today I have a quick comparison on the nail between Zoya Charla and Pure Ice Champagne. I love this type of color and finish and I think I may even have a couple more that are the same or similar. I used the Zoya and Pure Ice as accents for L’Oreal 811 Magic Croisette. This L’Oreal is a tiny mini size and I usually don’t buy them but found this one on sale and the pretty navy blue with “Charla-esque” shimmer won me over. The L’Oreal formula was really nice after I added a few drops of polish thinner. The shimmer is quite obvious outdoors and indoors adds a really nice glow to the nail. Charla and Champagne are exactly the same. They look the same, they went on the nail the same, the brushes are very similar. I did this mani yesterday afternoon and I will say the Pure Ice is showing a bit of tip wear already whereas the Zoya is not. I’ve worn this mani for about 30 hours now and removal of all three polishes was quick and easy with my scrubby tub. No staining either which is always a plus with blue polish!! So the pictures are 2 coats of each polish. Zoya Charla is on my ring finger, Pure Ice Champagne is on the middle finger and L’Oreal Magic Croisette is on the index and pinky. Zoya Charla is on my ring finger, Pure Ice Champagne is on the middle finger and L’Oreal Magic Croisette is on the index and pinky. So that’s today’s mani. I really loved it and I hope you enjoyed it too. Previous Previous post: OPI Gargantuan Green Grape AKA What was OPI thinking? ?